Last year my participation in the Sweet Swap was chaotic and disorganised. At the time, I had a super sick toddler so that was, in some ways, justified. Good grief. I’d got to the point where I had one afternoon in which to make something and take it to the post office and put it in an express post bag in the hope that it would arrive on Friday. Andy helpfully suggested that this could have been solved by dipping it in chocolate. Well, yes it could. And while cinder toffee is perfectly good to eat as a snack on its own, it’s also a sweet that works perfectly with other things. Crumble it through ice cream, across the top of chocolate cake or chocolate mousse. Or yes, dip it in chocolate and just scoff it. There are several subtly different approaches to making cinder toffee. Do you add water? Well, I don’t but this is apparently a good way of ensuring that the sugars don’t heat up too quickly. The temperature to which you heat the sugar before adding the bicarb will determine how hard or chewy the finished product is (if you’re familiar with a sugar thermometer that shouldn’t come as a surprise). 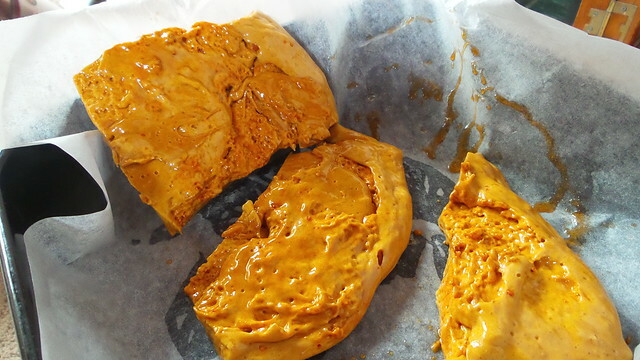 If you’re interested in the science of cinder toffee, then read this article in the Guardian. I was going to use a James Martin recipe but it required runny honey and we had none in the house, so I used this recipe, from Sweets Made Simple, a fun (and recipe heavy) programme hosted by confectioners Kitty Hope and Mark Greenwood. Making this has reminded me how much I enjoy cooking with sugar. Of course, any time you start to cook with sugar you need to remember that it gets HOT. Don’t stick your finger in to the toffee mixture, no matter how appealing it looks because you’ll get burnt. Leave things to cool for at least an hour and always approach with caution. Your life will be easier if you have a sugar thermometer. Gently heat the caster sugar, liquid glucose and golden syrup until the sugar is dissolved. Then increase the temperature and heat the mixture to 150°C. Use a sugar thermometer - and be patient. When the mixture hits 150°C remove from the heat and either whisk through the bicarb or stir it through vigorously. The mixture will froth up. As soon as the bicarb is mixed through, pour the toffee on to a baking sheet or tin lined with baking paper. When cool, break into chunks and ... eat. And make an appointment with your dentist!